What does Binion, who’s now 70, say of the all his recent acclaim? Not much. Binion, who’s one of the featured artists in a new San Franciscoexhibit at Jenkins Johnson Gallery called “Viewpoints,” doesn’t read anything that’s written about him. Not a single word. This self-imposed boycott of all media coverage is the antithesis of a culture that assumes self-promotion and a “look at me” navel-gazing as the only way to maintain one’s cachet and self-composition. But Binion likes to isolate himself — needs to isolate himself — to make art that he says is free of any outside influence. While Binion ignores what people think of him, he does think this: He’s making the best paintings of his life. And the art market agrees. So do galleries and art shows around the United States, which are featuring such work as DNA: White Painting: IV, a 12-by-12 foot vista of painted green grids that are imposed on old handwriting and old numbers like 10028, a ZIP code in New York. The scribbling becomes more perceptible as you approach the paintings, but the grids interrupt and break up the writing’s continuity — making it impossible to really study and access the information underneath. “Viewpoints” features the work of other significant African-American artists, and those from Africa and the African diaspora, including Romare Bearden, who in the 1970s was the best-known African-American artist; Blessing Ngobeni, a South African whose assemblages of painting, truncated scenes, and distressed figures, like those in Friends of the South, are commentaries on South Africa’s political system; and Aubrey Williams, the Guyanese artist whose Shostakovich paintings are intense pilgrimages to the inner state of feeling that Williams felt through the composer’s music. At Jenkins Johnson, Bearden’s 1956 watercolor work, The Gorge, reveals the artist’s lesser-known side — not Bearden the collagist of obvious figures but Bearden the abstracter who uses amorphous shapes to create scenes that suggest rather than pinpoint. 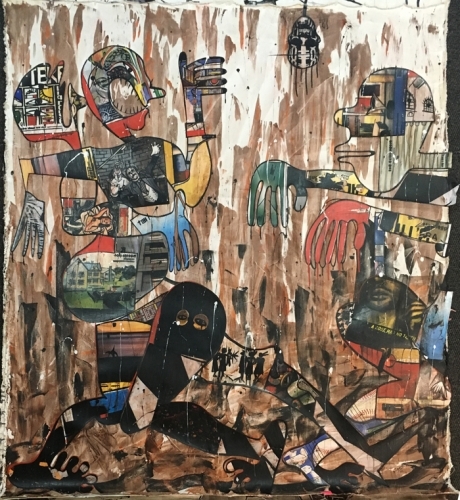 The artists in “Viewpoints,” whether young like Ngobeni, older like Binion, or deceased like Bearden and Williams, use abstraction to hint and suggest and imply — but they’re not giving their thoughts away. They don’t have to. They don’t want to. Their identities are complex. Binion says his paintings are like “social anthropology in a way.” Art-goers get to sift through the layers of grids, wording, and numbers. And what they find is almost up to them.